Yesterday was so beautiful here in Utah! After a week of rain, who would want to stay in side slaving over a hot stove. These pita sandwiches are perfect for a quick easy meal, when you just need to get outside. 1. In a large skilled heat 2 t. oil. Cook chicken and steak, seasoning with Fajita seasoning, until meat in cooked through. 2. Add the peppers and onion. Cook for 3-5 minutes until vegetables are cooked to your liking. 3. Add the cheese and stir until cheese is melted. 4. 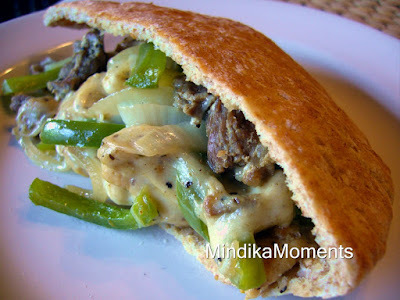 Serve immediately but stuffing the mixture into pita halves.